Jenna Blazevich a.k.a. 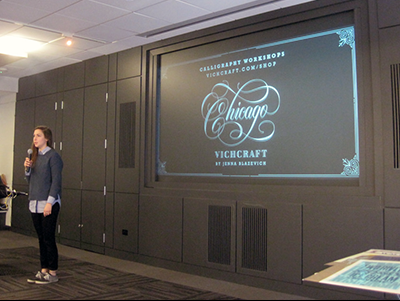 Vichcraft, a Chicago-based designer and hand-letterer, spoke at the 49th monthly gathering of the CreativeMornings chapter in Chicago. She shared selections of her graphic design, visibly fortified with handmade typography, from illustrative letterforms to calligraphy. Two aspects of her talk caused me to reflect. When seamless, email and its digital siblings in texting and social media are efficient shortcuts to communication. It’s easy to see why they are used frequently—they excel in passive communication. Blazevich’s craft of physical correspondence is extraordinary, because it’s unusual. When Blazevich showed her reel of handcrafted postal tidings sent to friends, colleagues and mentors, each demonstration of letter-and-envelope writing sizzled with sentiment and beamed with memories of the people who motivated her. Each mailing composed a timeline of touchpoints: literal, emotional, timely. While listening to her tour of hand-lettered messages, I was provoked to reunite with my father’s Remington typewriter and dispatch. Impressions count, especially in Blazevich’s practice of message-making, where character counts: in each word, phrase, sentence—in each thought. Proactive, compared to passive, communication. Whatever the medium, we’re lucky to live in a time marked by various ways to connect. Blazevich reminded the audience to keep in touch with the people who influenced, inspired, pushed, even questioned and contradicted our thinking at the time. To sustain a human connection with someone, who somehow improved our life, is remarkable. Blazevich claimed, “You’re not going to be commissioned to make your dream project, possibly ever, but definitely not in the beginning.” That term, “dream project,” turned my ears to tin. The vision of a “dream project” is a superstition that undermines the challenge to gain a project and execute it, then repeating the process toward winning work, even if it’s a piece of it. I perceived everything that Blazevich presented in her talk as a dream project, because all of it could have remained unrealized and, therefore, unknown. 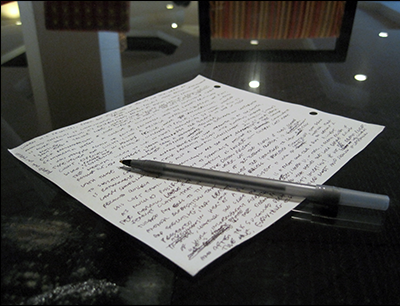 To do creative work, whether “commissioned” or not, is a recurring dream come true. Stretched incrementally over the course of one’s career, a body of work is, in sum, a dream project—a collective dream made true. If fixated on the dream project floating in the distance, then what defines the work before, during and after this dream project’s inception? If not perceived as a dream project, everything else is judged invisible in the dream project’s shadow. In retrospect, Blazevich should have shown nothing based on the inference that she has not yet reached her dream project. On the contrary, she showed work—invoked only through her desire to pursue each project and having the courage to commit to materializing all of it. Work becomes evident when it is seized, crafted and finished. The growth and potential of Blazevich’s creativity can be easily projected in the years to come. If this is not working and living the dream, or better yet, living and working a few dreams at a time, what is? 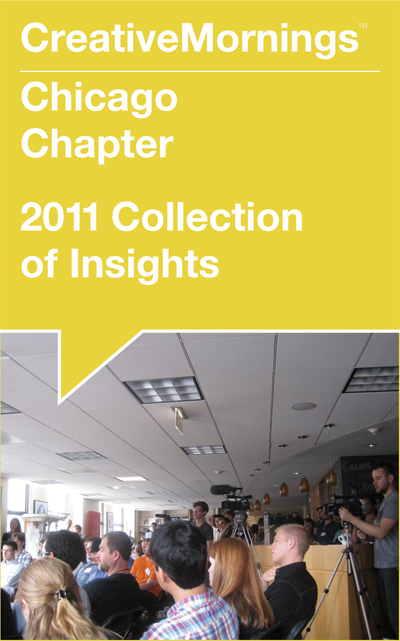 This CreativeMornings/Chicago write-up was done during a trip to “A2”—Ann Arbor, Michigan. 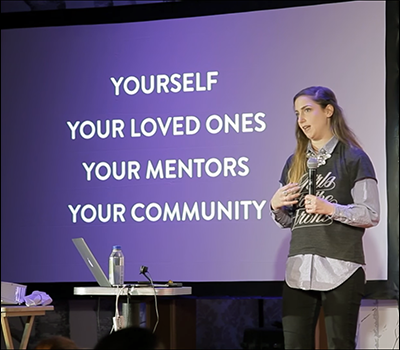 Photograph of Jenna Blazevich by videographers Alejandro Moore and Ben Derico, who donated their time, energy and documentation skills to preserving the January 2016 gathering of the Chicago chapter of CreativeMornings. Before being invited to become a CreativeMornings/Chicago speaker, Jenna Blazevich participated in “30 Sec Pitches” at the 39th monthly gathering with a talk by Jim Moran, Director of the Hamilton Wood Type Museum in Two Rivers, Wisconsin. Read my write-up and see my photos. Big thanks: to The Second City (Host), Braintree, Green Sheep Water, Lyft, for being Partners of Chicago CreativeMornings #49; to organizers Kim Knoll and Kyle Eertmoed who both spoke at Chicago CreativeMornings #7; to the team of volunteers for greatly helping to make CreativeMornings happen monthly in Chicago.